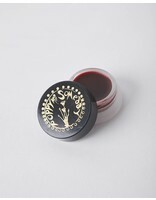 Restorative and soothing to dry lips. All organic ingredients used. Lip stains contain: Alkanet Root and Beet Root infused in Olive Oil, Essential Oil, Shea Butter, Cocoa Butter, Coconut Oil, and Beeswax. Naked: Free of essential oils and natural dyes.